A growing number of traditional enterprises are showing an increasing willingness to deploy modern cloud-based architectures that are open and enable real-time streaming of data, even if it means discarding legacy systems. That's the observation of Pivotal Software CEO Paul Maritz, who said a third of all companies realize if they don't take major steps, they risk being obfuscated by upstarts and competitors who have done so. "There are some old-line enterprises who are realizing that if they adopt the data-centric view of the world, they can literally rethink their businesses and tap into all new sources of revenue," Maritz said, speaking at the GigaOM Structure Data Conference in New York on Wednesday. "We are starting to see some players [realize] some new opportunity or some competitive threat they need to respond to. They're willing to build afresh. They're going to literally leave their IT legacy behind and create a new platform because they're realizing that either the opportunity or the competitors that they're going to face are going to use techniques that the consumer Internet giants have pioneered." Maritz said much of this shift has occurred over the past year. 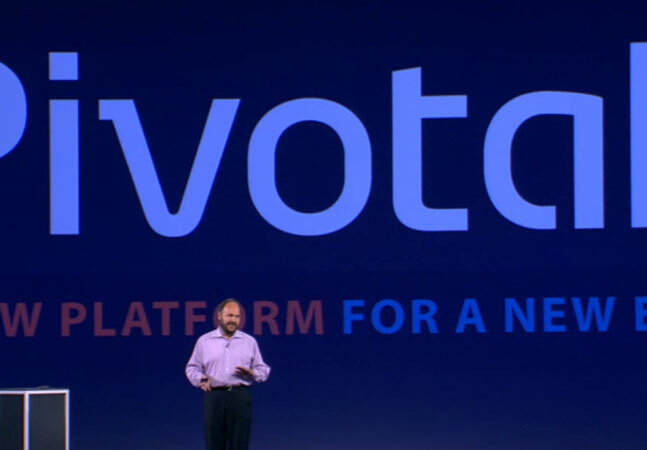 It was a year ago on the very same stage that he announced Pivotal, spun off from various assets of EMC and its subsidiary VMware, which Maritz headed as CEO for five years. They spun off assets from both companies including Cloud Foundry, Greenplum, SpringSource, Gemstone and Cetas with the goal of creating an open source application infrastructure based on cloud architectures to help organizations develop systems that can leverage streaming big data. Last May, Pivotal announced that General Electric had taken a 10 percent stake in Pivotal with a $105 million investment. Indeed, GE is an example of the old-line company Maritz was speaking about. Maritz related that GE CEO Jeff Immelt realized the evolution of the so-called "Internet of things" was a threat to many of the industrial conglomerate's business, where any upstart or established rival had the capability to respond better thanks to machine-generated data. As a result, GE revealed last year it would deploy software and sensors on its machines that would be the basis of what it calls the "Industrial Internet." "They created a whole new capability to allow them to build new generations of applications that can take the telemetry off all of their machines and do interesting things with it," Maritz said. "It requires somebody in the organization that has the conviction and strength to really do that." Organizations are still in the early stages of making these moves, but as Maritz puts it, many have taken steps. "We are in the first third of the journey still."